The public is invited to attend a community forum to discuss a new report on the high financial and human costs of “crimeless revocations” at 6:30 p.m., Tuesday, December 13. The free event will be held at First Congregational United Church of Christ, 1609 University Avenue, Madison, and will last approximately 90 minutes. There will be time for questions during the presentation. 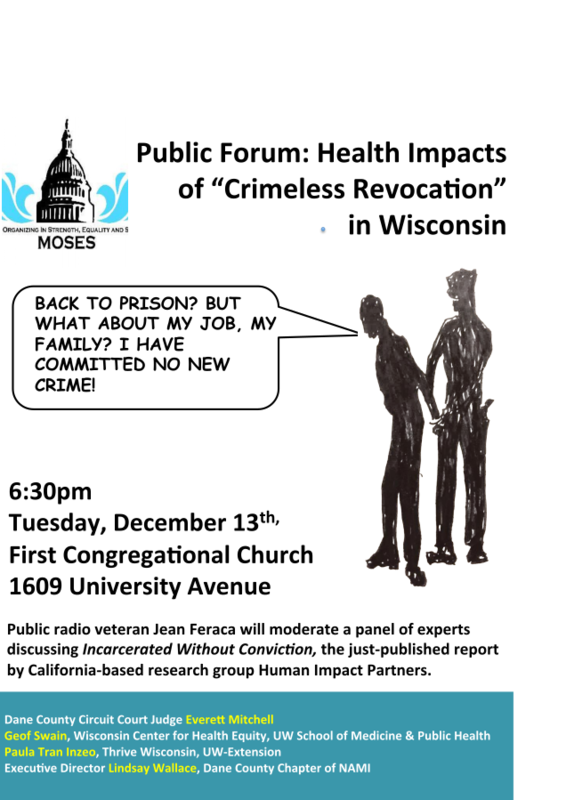 The forum will discuss the financial, human, and community costs of the Wisconsin Department of Correction’s practice of annually revoking about 3,000 former inmates back into prison even though they have not been convicted of a new crime (“crimeless revocation”). They have only violated a rule of their community supervision. is being sponsored by MOSES, the Dane County chapter of WISDOM, the statewide network of faith communities that works to promote criminal justice and prison reform, as well as addressing other related social justice issues. The presentation will begin with an overview of the report, conclusions, and recommendations. A panel that has extensive knowledge on how this practice affects our community will share their perspectives and answer questions. The panelists include: Dane County Circuit Court Judge Everett Mitchell; Geof Swain, Wisconsin Center for Health Equity, UW School of Medicine and Public Health; Paula Tran Inzeo, Thrive Wisconsin, UW-Extension; and Lindsay Wallace, Executive Director, Dane County Chapter, National Alliance on Mental Illness. The panel will be moderated by Jean Feraca, a veteran of public talk radio. n convicted of a new crime. Wisconsin taxpayers pay nearly $150 million per year for these revocations. The study is a Health Impact Assessment (HIA), a tool used to explore the anticipated effects of a policy change on public health. This HIA explores the ways individuals, families and communities would be affected if Wisconsin were to re-incarcerate only those who have been convicted of committing a new crime. The HIA uses available data from Wisconsin, as well as comparative data from states that have chosen various ways to limit the number of people incarcerated for rule violations, or who have limited the amount of time they can be locked up. The effect of these actions is to tear families apart, cause formerly incarcerated people who have struggled to secure employment to lose their job and their housing, separate those who have mental health issues from their treatment providers (they get little treatment in prison), and other human impacts.